Padded Shower Chairs by medline are designed for those who have problems standing in the shower. These will fit in most of the standard bath tubs. The chair has rubber tips that will prevent you from skidding when getting in an out of the bathtub. Legs can be adjusted based on the need and comfort of the user. The padded seat provides comfort to the users while taking shower. Can hold upto the weight of 300 lb. 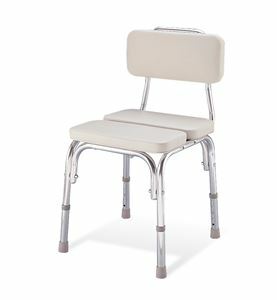 Padded chair shower with back provides extra support to those who have spinal cord issues.